Nothing is better than sharing your joy with the people that need it the most. This year I have decided to give my birthday towards a cause that is very dear to me. The nicest gift that you could offer apart from being close to me would be to support this cause. So rather than buying me a present, please donate to keep a disadvantaged child in school. What is Teach for Romania, their mission and their values? Teach for Romania is a Non-Governmental Organization with a mission to recruit and select the most valuable young Romanians, train them as inspirational teachers and support them to become leaders in Romanian education. Teach for Romania's vision is to create opportunities in life through quality education for every child in Romania. The Teach for Romania model was initially developed in 1990 by Teach for America in the United States. It aims to attract top graduates who would not have normally considered the teaching profession among their future professional options. The model works successfully in 38 countries across 6 continents, where it is implemented by the partner organizations of the Teach for All network. Teach for Romania core values are Integrity, Excellence, Authenticity, Perseverence, Determination, Life Balance, Collaboration and Continuous Learning. 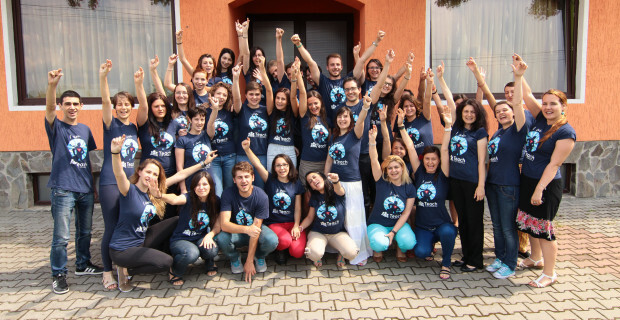 Teach for Romania has had a tremendous success over the past few years since its inception in Romania in 2014 and continues to grow - since last year, the number of teachers in the program and the number of schools has doubled (so thank you everybody who participated in last year’s campaign!). This year’s aim is to retain c.60 teachers by the end of 2017 who will teach to c.4,500 children in Romania. As most of you know by now, helping underpriviledged children has always been an important part of my life and I would like to continue to give back in the best way that I can. After I have coordinated a series of projects targeting disadvantaged communities back home in Romania, I came to the conclusion that the only way of making a lasting change and give those children a chance to succeed in life is by promoting access to quality education and make it available to those communities who need it the most. The education and qualifications that a child receives, as well as the environment that he develops in, are crucial for the opportunities that he would have later on. The teachers at Teach for Romania promote an education based on solid values, broadening their pupils life choices and horison. 1) Please share the fundraising link via social network (Facebook, Twitter, LinkedIn etc) and distribute directly to those interested in this cause (family, friends, your colleagues, people who care and can help). 2) Please donate. Contributions are highly encouraged and needed to reach the campaign goal. 3) Please stay involved beyond the end of this fundraising campaign so that we continue to build a better education system and create opportunities through quality education for every child in Romania. La multi ani Jony. Sa ramai mereu acelasi suflet mare!!! matching all donations today, as promised! Esti deosebit. La multi ani cu sanatate! La multi ani ! Bafta.